Safety Reflector with 10 hour battery for your emergency light or safety light. Batteries inserted (2 LR 44 button cell batteries). A lot of Flash for a Little Cash! 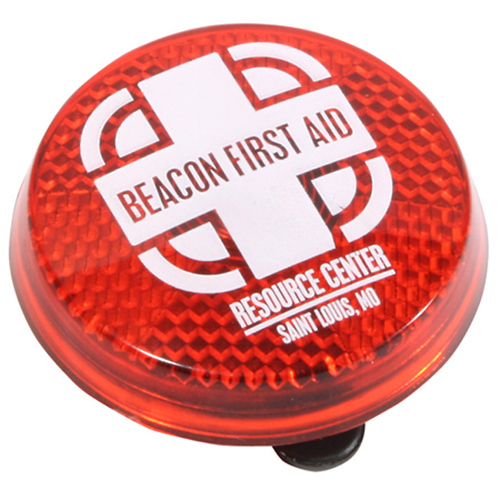 A flashing safety light with a reflector design and clip on back. Lights up with a blinking red light. The ideal gift for joggers, walkers, cyclists and trick-or-treaters.The clip on safety light works well on your bike or just walking the dog. Bulk / 27 lbs / 600 pcs. / 24 x 14 x 15 box.